Ofcourse! That's the final step: booting TS2, and simultaneously trying to shove Origin down the throats of existing TS2 players with promises of continued support. AS IF EA SUPPORT WAS EVER WORTH RECIEVING! Just keep on working it, EA. Just pretend we didn't just catch you with your nickers on your ankles, and your spyware in our files. Interesting. What does that mean though? Will it be updated to run properly on Windows 8? What's this extra content they speak of? Is it just all the EPs and SPs in one "ultimate" game? Will you have to run Origin to play it? The whole thing is very mysterious. I got that e-mail too. So, according to you, BoilingOil, this is no good news? I'm unsure. I have all my games registered and I have AL installed, so I am hoping this is the promised Store edition/M&G fix they never did. Then again I barely trust EA to do this right. We'll have to wait and see. Well I have no intention of reinstalling my whole game when it's working perfectly fine. That's just asking for trouble. 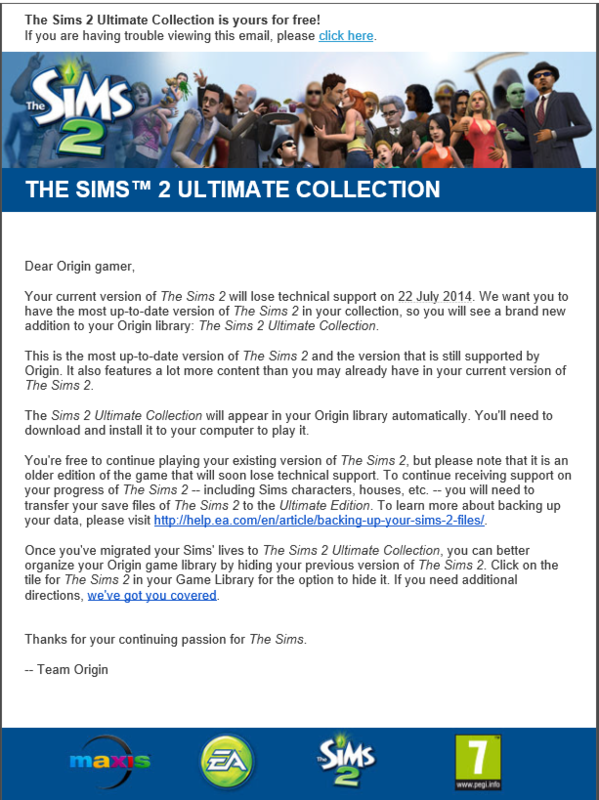 That it's supported by Origin - is more likely that what they mean is that if you've bought the digital versions of The Sims 2, they're not going to be available after the date on the mail. It's a classic, we're migrating everyone to the easiest one for us to support. Given that Origin doesn't give game support, they support the digital marketing of the game - it's about purchase support, not game support. My guess is that if you have any digital expansions - this is going to be the only way you keep them. Ah, that makes sense, kiri. In an evil corporate way. Guess it's always best to have a physical copy that doesn't depend on their servers to play. (15-07-2014 08:16 PM)poisson Wrote: I got that e-mail too. So, according to you, BoilingOil, this is no good news? Indeed, that is exactly what I think. If I know a bit about the way the guys at EA think, at the very least you can be sure that this "ultimate collection" requires that Origin is installed and active on your system. Otherwise it will most likely not play. Secondly, it may mean that parts of the game can only be accessed while online, and it may even result in many of he old mods and other custom content to become invalid/incompatible. How, I ask you, can ANY of that be a good thing? Well, we don't know anything yet. I definitely wont be installing over the top without a backup, and i would also like to see what is needed to run the game and what extras if any there are. I have a couple of games from Origin (Peggle and Plants vs Zombies) and neither of them need Origin started to play the game or to save. I had to start Origin to download them, and that is it. I do agree that its a worry about SimPE and any mods using the AL engine; we have no idea if the engine has been updated.